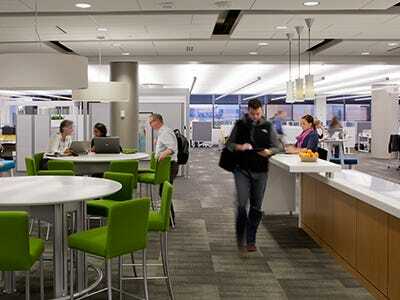 Visitors to Steelcase’s Finance department are surprised by its openness and shared spaces. Imagine the traditional office setup. Now un-imagine it, because the workplace of the future won’t look anything like the offices and cubicles we’re used to seeing. When office-furniture company Steelcase redesigned its offices, its goals were to increase collaboration while cutting the real estate needed per worker. And the creative approaches it took offer inspiration for other companies to reimagine the way they use space. It’s that combination of flexibility and functionality that appeals to employees, who, even when working remotely is an option, prefer the perks of an office to the comfort of a living room couch. In a Steelcase and CoreNet Global report, 72 per cent of workers said that an office is the best place to interact with colleagues and access tools and technology. Lauren Renner, a financial analyst at Steelcase, doesn’t have a fixed office, a cubicle, or even a desk. Instead, every day she picks from among the individual and group workspaces in her department, working at whichever one suits her needs best. Shared spaces give employees more options in terms of the way they choose to work. From an organizational perspective, eliminating typical offices and desks increases the number of people you can fit into one space. Steelcase’s redesign of its headquarters cut the real estate required for three departments by almost half. Tomorrow’s workplace is, above all else, adaptable. Achieving the right balance of shared and owned spaces opens up endless possibilities, so that collaboration happens not just in meetings but all the time, everywhere, in whichever ways work best for your employees.